Imagine if you had x-ray vision about your competitors…and even your partners and clients!? Well, lately, I feel like I do. It’s called the SEO Toolbar (instructions on downloading it are below); it provides you a toolbar on your Firefox Browser that you can turn on or off while you’re using the Web. In the first screenshot, I hit the blue info button in the upper left-hand corner to get the pop-up yellow screen of information about eBay). Page PR and Site PR (both of which are — This represents a 1 to 10 Page Rank score that Google is providing on eBay (Google’s Page Rank represents how relevant Google thinks the Web page and Web site you’re on is (the higher the score (out of 1 to 10) the better). Site Age — This is when the Web site was first launched (e.g. useful to know if this is a veteran Web site or the new kid on the block (eBay’s been around since June of 1997). 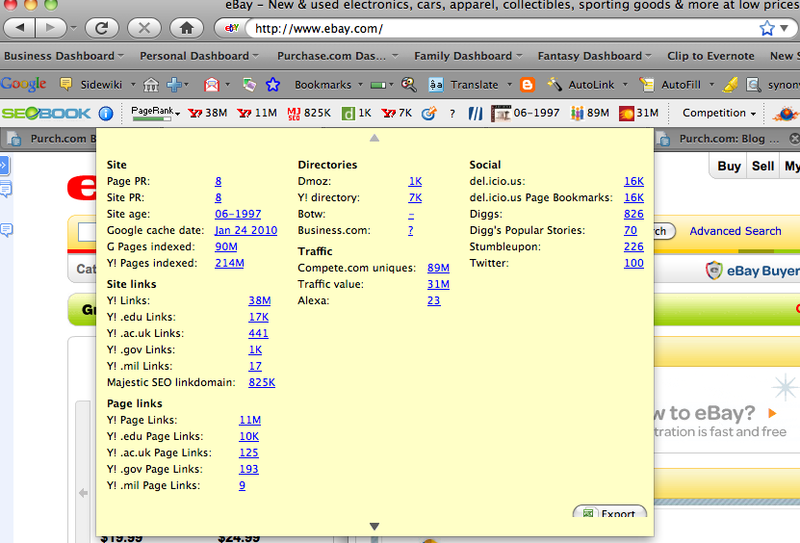 del.icio.us — This is the number of bookmarks that members of the Delicious Web Site have made of eBay’s Web site (Delicious is a site that allows members to bookmark their favorite sites and Web pages and share them with friends). So, in this case, Delicious members bookmarked eBay 16,000 times. Diggs — Digg is a Web site that allows its members to “Digg” articles or Web pages they enjoy; and then the most Dugg Web pages are shown on Digg’s popular home page (so, 826 of eBay’s pages have been “Dugg”). Twitter — This is the number of times that members of Twitter have linked to a Web site (e.g. 100 times in eBay’s case). In the next screenshot, I’m showing the Rank Checker feature which allows us to type in any keyword (search term that people type into Google) and see where any given Web site ranks on the search results for that keyword. 2nd for the term “Auctions” (eBay is the dominant auction provider on the Web (the company that ranks 1st is a Live Auction proider called Auction Zip). Rank Checker allows many keywords (at least 100 at a time) to be ranked. Now, I highly recommend you couple this Rank Checker tool with Google’s Keyword Tool (which tells you how much any keyword is searched on Google) which SEO Toolbar also includes. So now you can tell how well a Web site is doing in terms of its relevancy on the most popular keywords in your business! If you use Google Analytics on your own Web site, you can simply copy and paste your top keywords from your Analytics account into Rank Checker and see where you’re ranking on Google. The Rank Checker also shows you where a Web site ranks on Yahoo and Microsoft Bing — I just didn’t have room in the screenshot to show it! There’s a lot more to the SEO Toolbar than this, but those are some highlights for me. And if you have questions on any of this, feel free to post comments below and I’ll do my best to answer them. If you like this article, you may want to check out my Got Googlejuice? posting. The purpose of Purchase.com is to help businesses grow, profit and organize. That’s a lot of searches! People seem thirstier than ever for the ability to post classified ads (perhaps due to the economy) – and they usually prefer that they are free. Towards that end, I employed a friend of mine to help create a simple free business classifieds application that allows anyone with an email address to post a product or service for sale. To post a free business classified, you simply go to the home page Purchase.com or specifically to Add a Free Business Classified. Other classified Web sites, such as Craigslist (which I’m a big fan of), allow you to post most classified ads for free; however, Purchase.com plans to differentiate from them. Such difference might include focusing on business to business classifieds, small business classifieds, free local classifieds and some other items (more on that later). For now, go experiment with your free classified ad posting on Purchase.com — you can do it in just a few minutes. We have kept the design very simple so please be forgive its ugliness…but the functionality should work. And, as always I’d really like to hear what you think. If you had to master one concept in online marketing, this would surely be it. 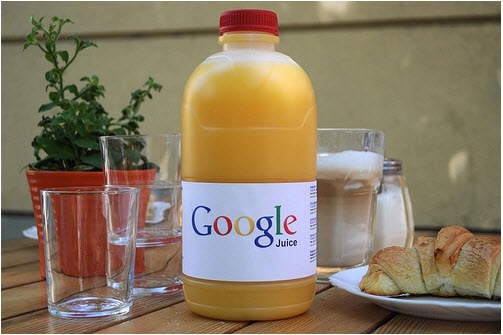 I’ll give some Googlejuice tips below…but first, some of you might be asking: what is Googlejuice? Googlejuice is a catchall for a handful of things that you and others can do to make your products, business or anything else show up high in Google’s rankings when people search. By the way, there’s a great book called What Would Google Do? that recently came out — it has a few pages on Googlejuice and in general how to work better with Google. So why is Googlejuice so important? Because it can send enormous traffic to your Web site — and you don’t have to pay marketing dollars for it! When you search on the names of your product categories, products, company, executives or industry, does your organization show up first every time? If the answer is yes, please contact me as I’d like your advice! If the answer is no, you may find the rest of this article helpful. What’s the secret? I don’t know. Google Juice is based on secret algorithms, and we’ll probably get the formula around the time Coke gives out its secret recipe! Have Many Links to You– The more sites that link to you the better; Google considers these to be endorsements of your reputation. Have Quality Links to You — The higher their Page Rank (a score Google gives your site (named after founder Larry “Page”) the more Google Juice you get. Have .Gov and .Org Links to You – Google sometimes gives links from .Gov and .Org sites more Juice than links from .Com sites (all other things equal) because they are typically linking out for reasons other than making money. Be Clear & Specific – If you’re in the business of selling a vetinarian instrument for operating on squirrels, say it…People do search on such specific terms and if when they do they will find you! Be Simple – Google tries to behave like a human so don’t get fancy with graphics and such…just simply describe your services. Have Permalinks – Google rewards you for Web pages that stick around a long time (as long as they have useful information)…so if you have some valuable information, write it on a Web page and keep it there! Now go enjoy a Googlejuice smoothie!